« WHS FRC Team 5735 to Compete at NE District Championship! 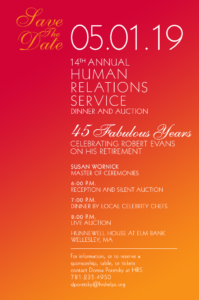 Please join in celebrating and supporting the important work of The Human Relations Service (HRS) by attending the 14th Annual Dinner and Auction on Wednesday, May 1st at Elm Bank in Wellesley, MA. Special recognition will be given to Executive Director Rob Evans who will be retiring after 45 years of dedicated service.